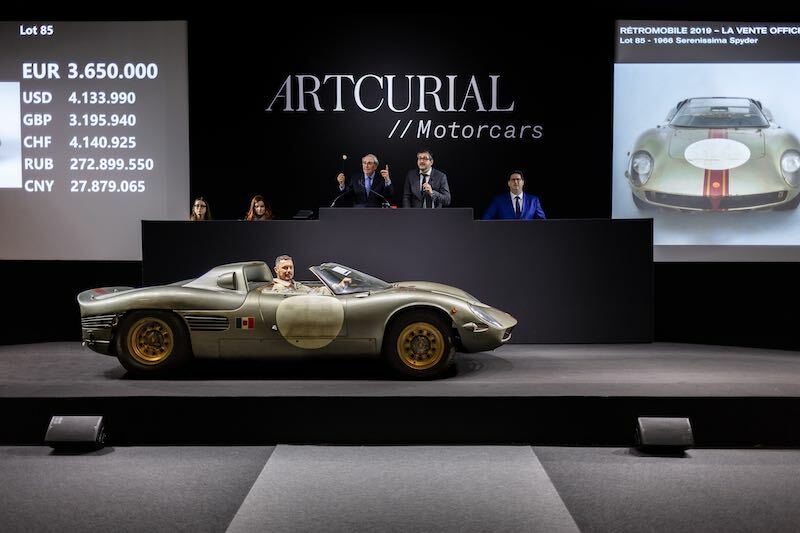 The Artcurial Retromobile 2019 auction was held 8-10 February at the Retromobile Show in Paris, resulting in €42,304,574 in total sales and a 76 percent sell-through rate. Maitre Herve Poulain, accompanied by Matthieu Lamoure and Pierre Novikoff, brought the hammer down on three lots over one million euros and 43 lots over €100,000. Buyers from over 20 countries outside France accounted for some 84 percent of the sale total. A 1939 Alfa Romeo 8C 2900 B Touring Berlinetta took the top result at the 2019 Artcurial Retromobile Week auction. Selling for €16,745,600 ($18,922,528 USD), the 8C Alfa Romeo became the third most expensive pre-war car ever to sell at auction. It was also the highest price of any car sold during the Retromobile Week sales in Paris. Having been in the same family ownership for over 40 years, the Touring-bodied Alfa was bought by a private collector from the US. The car’s previous owner, a Dutch collector, who was sitting in the front row of the saleroom, was delighted to know that his automobile would be joining the collection of another passionate enthusiast. His father had bought the car for around €10,000 some 43 years ago, and it had remained in the family since then. Another Italian, this time a competition spider with unique history, the 1966 Serenissima Spider (lot 85), sold well above its high estimate at €4,218,800. It was one of three Serenissima cars entered in the auction by Count Volpi, the man who set up the marque and ran a racing team with the same name. With several collectors bidding in the room and on the telephone, the bids soon rose above the pre-sale estimate of €1,300,000 – €1,800,000, and the car was bought by a private collector from the US. This special Spider was the only surviving example of two built, and the only Serenissima ever to take part at Le Mans. It competed in the 1966 Le Mans 24 Hours, driven by Jean-Claude Sauer and Jean de Mortemart. Four other pre-war cars discovered in a Belgian barn also attracted interest, selling for close to €1M in total: lot 29 – a 1929 Bugatti Type 40 (estimate €100,000 – €130,000 sold for €190,700; lot 20 – a 1937 Bugatti Type 57 Cabriolet by Graber (estimate €400,000 – €600,000) sold for €500,600; lot 31 – a 1932 Bugatti Type 49 Vanvooren, (estimate €150,000 – €200,000), sold for €196,700; lot 32 – a c.1925 Citroe?n 5HP (estimate €10,000 – €15,000) sold for €21,500. Other highlights of the Artcurial Retromobile 2019 sale included a 1927 Citroen DS21 Cabriolet (lot 72), which changed hands for 244 400 € / 276 200 $, lot 111, a 1974 De Tomaso Pantera Group 4 spec, which sold for twice its estimate at 202 600 € / 229 000 $ and a 2009 Mercedes SLR Stirling Moss Edition (lot 131) which fetched 2 617 000 € / 3 000 000 $. Finally the 1971 Porsche 916 Prototype ‘Brutus’ (lot 124) sold for 953 600 € / 1 077 568 $, one of the ten record auction prices achieved by Artcurial this week. For complete auction results, visit Artcurial.com. The final day opened with the sale Racing, Flying & Yachting which included the sale of an unusual item: a full size Renault single seater built entirely of LEGO. This Renault F1 Team car (lot 93) fetched the sum of 95 300 € / 107 700 $, and proceeds from the sale will be donated to UNICEF. A race suit worn by Ayrton Senna (lot 65) changed hands for five times its estimate, selling for 97 500 € / 110 200 $. The week of sales closed with Vibration, comprising the largest private collection in the world of Formula 1 helmets and race suits. Lot 57, a helmet belonging to Alain Prost, achieved the top price of 54 600 € / 61 700 $, double the pre-sale estimate.